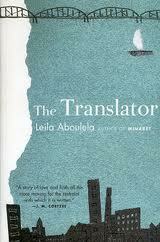 Book Review: Leila Aboulela's "The Translator"
Cultural differences, grief, love and religion. These are a few things Leila Aboulela touches upon in her debut novel The Translator. Sammar, originally from Khartoum, Sudan has been living in Aberdeen, Scotland for the last four years mourning the loss of her husband, Tarig. Sammar returned to Khartoum briefly with Tarig's body and their young son. But her mother-in-law blames her and she's not able to cope with him being gone. So she leaves her son and returns to Aberdeen. There Sammar, who works as an Arabic translator in a university in Aberdeen, is in mourning. She wears no colours, no perfume, no make-up, and there's very minimal furniture or things in her home. In fact, her mood over the four years in a way mirrors the cold, grey weather of Aberdeen. That is until she gets to know Rae, the Scottish Islamic Scholar who she does a lot of translation for. A bond grows, which remains unspoken, due less to culture and even race, and more to religion. He might be an Islamic Scholar and know a lot about Islam, but he is secular. Islam is a part of Sammar, it is how she lives her life, how she makes sense of everything. As her faith was stronger than the feelings she was developing for him, Sammar was struggling to deal with these new-found feelings and him not being Muslim. Sammar also feels torn about her son that she left in Khartoum. On a trip back to do some translation work, she now has the chance to return to her home to be with her son and hopefully reforge the bond. Khartoum is also described in stark contrast to Aberdeen. There might be power outages, and it might be hot at night, but compared to the coldness that Scotland offered Sammar for years, this is great. She is also able to be herself more here - she can say Insha'Allah (God willing) without it seeming weird, and if she wanted to she could take out her prayer mat in the middle of a gathering without freaking the whole room out. Sammar was a very sad woman following the loss of her husband, who was just about living. I think Aberdeen and its greyness was the perfect landscape for Sammar's sadness. But I also loved how over the course of the book we got to see life slowly being restored into her. Like when she bought a henna coloured coat from the mall - the first bright thing she had worn in 4 years. Despite her sadness, I actually liked Sammar as a character. I understood her pain, her grief, her sorrow. Losing her husband must have been hard, and it must not have been easy to leave her son behind. But I also smiled when she was slowly emerging from her sad state of mind. I loved how strong she was in her faith, and could sense how torn she must have felt about her feelings for a Scottish secular professor. I thoroughly enjoyed The Translator. This was a short but powerful novel, which I would higly recommend. Did you know you can shorten your urls with AdFly and make money from every click on your shortened links.